Last year I wrote couple of blogs about a largely unrecognised element of the First World War story; the Zeppelin bombing raids over England and the competition to develop a British airship to rival the German Zeppelin. My focus was my great-grandfather’s attempts to persuade the War Office that his airship design would both be a significant improvement on those currently being developed and therefore be capable of establishing a British presence in the skies. Recently Jerry White has published his book “Zeppelin Nights: London in the First World War”. So far I have only been able to give it a quick perusal but I was interested to see that he has drawn heavily on the same diaries by H Rider Haggard that I found so valuable in illustrating the impact of the Zeppelin raids on London. I was drawn to Rider Haggard’s diaries because of a letter he wrote my great-grandfather, Alfred John Liversedge (AJL), in November 1915. My grandfather had sent him a letter and pamphlet and he thanks him for these; “I am glad to know from one who has studied the matter, that my suggestion as to a supply of British airships able to cope with Zeppelins, is not altogether impractical”. The pamphlet is possibly an earlier copy of that held by the British Library, “The Importance of The Large Airship as demonstrated by recent events on land and sea” published in January 1917 by AJL. Notes written by AJL describe his frustration in trying to get approval for a prototype of his design to be constructed. His proposals were first turned down by the then Frist Lord of the Admiralty, a Mr Winston Churchill, not reportedly a supporter of the airship in general. 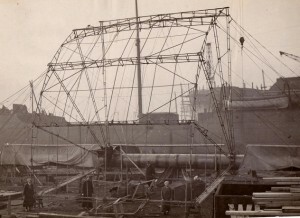 Luckily he was moved on and his replacement, Mr A. J. Balfour, promptly took them up AJL’s proposal and eventually, after more delays, he was able to start construction at Earles Shipyard in Hull. Sadly it was by then too late and the project was stopped on the grounds that he would not be able to have an airship completed in time to be of service in the war. 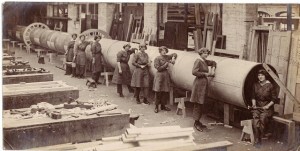 I do though have a marvellous archive of his photographs detailing the construction and particularly featuring the young women then being employed in heavy engineering. Will you contact Jerry White Barbara to compare notes anout your Grandfather & the context of your research? I don’t think so, its fairly minor stuff I reckon. I have just found your fascinating pictures of the Liversedge airship and as Editor of the Airship Heritage Trust’s Journal ‘Dirigible’ I wondered if you would be interested in allowing me to publish some of them in a future issue? Our aim is to preserve the memory of as much knowledge of past airship activity as possible and the Liversedge is a new one to me personally. I’ve just emailed you separately. But yes very pleased to provided some photographs to the journal. I had come across it in my research and was, eventually going to make contact.